Things are starting to wind down in Marvel’s event, Civil War II. All in all, it hasn’t been bad in terms of story. It is a believable one, but some aspects of it are ridiculous. For those who haven’t followed or maybe missed a couple of issues, this story revolves around an Inhuman named Ulysses. The Inhumans have recently been thrust into the spotlight. They have an event with the X-Men coming up soon called, you guessed it, Inhumans vs. X-Men. Honestly, I’m excited for the event. I’m vocal about how the X-Men haven’t had many good stories recently in Marvel. Well, I don’t know if that’s true, I’m just tired of the X-Men being thrust into a battle every five seconds. Anyways, the Inhumans are center stage now when it comes to Marvel events. They are a resilient group that is determined to find their place in the world, even if that means taking people out. They are exactly like the mutants in the sense that the world fears their powers. People run when they find out their closest friend or family member is an Inhuman. The Terrigen Mist adds an extra layer of fear for normal humans as well. Also, a layer of excitement because when exposed for the Terrigen Mist, normal humans can discover their undiscovered Inhuman powers. Some want them, others do not. Ulysses could probably be thrown into the category of people who didn’t want his powers. From the beginning of this event, he’s been scared of his abilities. Ulysses can predict the future. In the first issue, he helps the Avengers stop some sort of cosmic monster. Everything’s all good, right? As we know with the Marvel universe though, nothing can get solved with talking and rational thought. Makes it interesting for us, but it makes these characters look like children sometimes. Captain Marvel wants to use Ulysses on her team. Tony Stark is a futurist by heart, so he abhors the idea of someone creating the future before it happens. This creates a rift and bam! We have Civil War II ladies and gentlemen. Some verbal sparring and setup was the bulk of the first three issues. Oh, and now Bruce Banner is dead. Hawkeye killed Bruce Banner at the request of Bruce. He didn’t want to Hulk out again and cause any more problems for his friends. The trial split the heroes and Hawkeye was found not guilty. Iron Man then rescued a woman who was being profiled by Captain Marvel for a crime she was going to commit (according to Ulysses.) This led to a huge battle in issue #5. During the issue, Ulysses’ powers start to take on physical form. Parts of his body have white energy emitting from them. He wraps the heroes in the energy, and they see a terrible image. It’s an image I won’t ever forget. Miles Morales stood on the steps of Capitol Hill. He stood over an impaled Captain America (Steve Rogers.) The brutality of the scene is too much for Miles. He drops to his knees and removes his mask halfway. Tears are rolling down his face. Captain Marvel has the audacity to approach Miles, and tell him that he’s under arrest. This is where the sixth issue picks up. Miles can’t contain himself. He’s still on the ground when Captain Marvel continues to bother him about giving himself up. If I had the dimensional warping powers and the super strength to do it, I’d conjure up this version of Carol Danvers and punch her in the face. I understand possibly going after Hulk. But Miles? I’m not the only one who thinks it’s ludicrous. 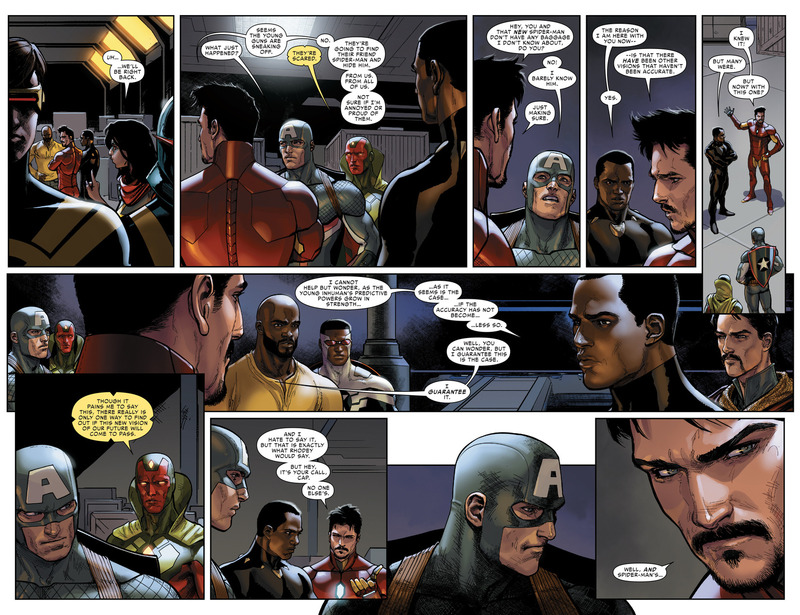 Tony begins to defend Miles, saying he hasn’t done anything during his time with the Avengers. During their argument, Miles isn’t saying anything. He’s still just on the ground with his hands on his head. Steve Rogers comes in and says some cheesy mess to Miles about putting his mask on. I can’t take anything Steve is saying seriously anymore (read the Steve Rogers and Sam Wilson comics to see what I’m talking about.) After Steve says his piece, Thor takes Miles away from the battle. My favorite part of the issue comes next. Black Panther is a part of Captain Marvel’s team, the Ultimates. Throughout this entire event, he’s backed her up. I didn’t get why though. Captain Marvel is acting like a zealot right now with her misguided sense of duty. I didn’t understand why T’Challa was okay with what she was doing. It doesn’t seem like it was in his character at all. We didn’t get any background as to why he sided with her, other than the fact he’s on her team. But after Miles is taken, Maria Hill puffs her chest out and tries to arrest Tony’s team. T’Challa intervenes and tells Captain Marvel he can no longer defend any of this. He says he’s grown uncomfortable with his role in all of this. He goes on to say that in the past, he could rest easy because he was on the side of Captain America. Now that they are on opposite sides, he finds difficulty defending Carol’s actions. While that’s a bit lame, mainly because Black Panther is his own man and that made him sound like a bit of a follower, I liked someone finally stepping up and saying, “This is dumb.” Doctor Strange then teleports Iron Man’s crew, and Medusa leaves with the Inhumans. Thor drops Miles off on the top of a building for him to be alone for a bit. The artwork here is stunning as Miles replays everything that had just happened in his head. He removes his mask and tears are running down his face. He can’t contain it anymore. He lets out a heartbreaking scream. The skyline in the background looks gorgeous. The artwork by David Marquez has been spot on this entire event. An interesting scene happens next with Starlord and Captain Marvel. He just reassures her that what she’s doing is right. I only find it interesting because we’re probably going to see them have some type of relationship in the MCU. He might show up in her film or something and if they do Civil War II in the MCU, the Guardians will definitely be on her side. After that scene, the rest of Iron Man’s team is back at an underground bunker. The younger kids on the team aren’t comfortable with what’s going on anymore. Ms. Marvel, Nova, Cyclops, and Riri Williams all decide to leave the bunker to go and find Miles Morales. I like this because this is the beginning of a good team. They have a new series out now called Champions. While I haven’t read it yet, I’m sure it’s fun and fresh. The issue wraps up with Captain Marvel having flashbacks of everything that’s happened. War Machine and Bruce Banner have been killed during this event. It’s all weighing her down a bit. Maria Hill comes out to talk to her. She informs Captain Marvel that Spider-Man has been found. The last page is Miles standing on the steps of Capitol Hill, which is where he kills Steve Rogers in the vision. They’re probably just leading us to believe something like that might happen. Maybe Miles kills Steve, but not for the reasons we think. Maybe that Hydra stuff catches up with this event and the Avengers are forced to kill their friend? That’s doubtful, but I don’t think Miles is going to kill Captain America for no reason. I really liked the way Miles was drawn/looked in this issue. He had a solid build and presence. More so than I’ve ever seen before. He always has kind of looked small and weak at times, even though he’s not. Maybe nothing changed, but to me, he looked different in this issue. I’ve said this before, but the story of Civil War II is a good one. The believability of it though, especially on the side of Captain Marvel, is getting me right now. She is tripping and I hope they don’t make her like this in the films. Tony Stark is annoying as usual and the best part about this event has been the building up of the younger characters. I hope this all ends well for Miles. No one else needs to die over this Ulysses kid. The Inhumans have a history of not understanding their powers anyway, so he seriously needs to get tested or something. If not, those visions will keep getting worse and people will keep dying. I hope you enjoyed this review! How do you think Civil War II will end? Who’s been the highlight of it all? Please make sure to comment and like this review. Follow me on Twitter @Hero_Review and until next time!